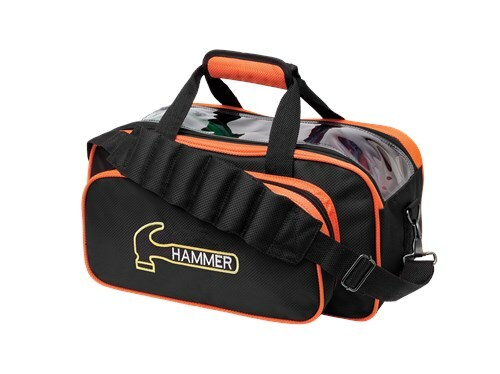 This bag is great for holding two bowling balls, your spare and performance ball. There is long-lasting stitching to hold the bag together and a worry-free clear view top to recognize which bowling balls you are bringing with you. Solid construction; comfortable straps with plenty of length; I like the clear cover so you can see which bowling balls are in the bag. Good as a second bag to carry extra balls. Could be good for a person with one ball and small feet that could put small shoes where the second ball would go. Not enough room for big shoes (13) even with only one ball in the bag. It is a quality bag but not good as your primary bag unless you like carrying or renting your shoes. Due to the time it takes to produce the Hammer Premium Double Tote Black/Orange ball it will ship in immediately. We cannot ship this ball outside the United States.